The mission of International Sanctuary is to empower people rescued from trafficking to transform themselves into survivors by embracing their true identity and worth. Our mission is to empower girls and women escaping human trafficking to embrace their true identity and worth. By providing meaningful employment through International Sanctuary's social enterprise, Purpose Jewelry, girls are able to support themselves and obtain job training and experience. Through iSanctuary's wide range of holistic care services young women can begin to heal and grow in mind, body, and soul. It is iSanctuary's mission to not just sustain victims of modern-day slavery, but to provide the tools and life skills they need to embrace their true identity and worth, and transform into survivors with true freedom. By 2020, iSanctuary will create 10 new sanctuaries worldwide where girls and women are transformed into survivors. To learn more about this vision visit the 2020 Plan page. 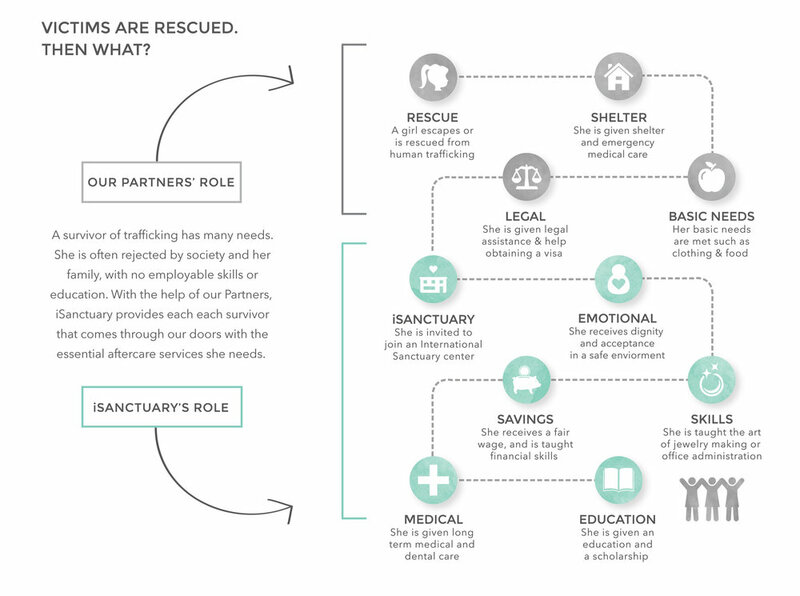 International Sanctuary empowers survivors to obtain true freedom. as one wants without hinderance or restraint.